Today in hockey history, a player records a milestone very quickly, a hated animal makes its first NHL appearance, a “goalie” is forced to step in net, a man takes over both a coaching position and another position, a coach is mercifully relieved of his duties, Gretzky falls just short of setting a record, teammates combine to tie a crazy record, and a team falls apart and gets embarrassed. 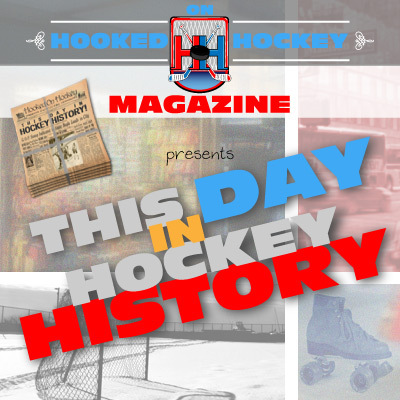 December 29, 1945 – Maurice Richard scored twice in a 5-4 loss to the Black Hawks to record his 100th career goal. And he reached the mark in just 145 games, the fastest in history. That mark has since been broken…not by the Great One, but by Mike Bossy, who reached 100 goals in a mere 129 games. Surprisingly, the answer is not Teemu Selanne, who had an unbelievable 76 goals in his rookie season (84 games), but scored just 25 in 56 games next season. December 29, 1955 – Zebras came into existence! In a game between Montreal and Toronto, NHL officials wore new vertically striped black-and-white sweaters for the first time. What kind of zebras did you think I was talking about? The Canadiens won the game 5-2. December 29, 1957 – Ross “Lefty” Wilson (why does everyone from 1900-1960 have a nickname?) had to replace Boston goaltender Don Simmons, who suffered a dislocated shoulder in the game. And if you’ve been paying attention to this segment, you should already have figured out two unique facts about Wilson: he was an assistant trainer, and he was employed by the opposing team (Detroit). Like many teams back then, the Bruins had no backup. Wilson gave up just one goal in 52 minutes (23 saves) and the game ended in a 2-2 tie. In his “career,” Wilson actually jumped in net as a backup for the Leafs (still with Detroit, made nine of nine saves) and once for Detroit. The three games total all of his only NHL experience. December 29, 1969 – Charlie Burns took over as the Minnesota North Stars’ coach, replacing Wren Blair. Two months later, he participated in his team’s game, as a center. At season’s end, he stepped down as coach, but remained a player on the team until 1975. After retiring as a player (again), he once again went behind the bench for the North Stars, but not as a player. He was the last player/coach in NHL history. December 29, 1975 – The Capitals fired general manager and coach Milt Schmidt in the middle of the team’s second NHL season (Max McNab replaced Schmidt as GM and Tommy McVie took over as coach). Well, I can’t say Schmidt didn’t have it coming: after coaching the team’s final eight games of its horrendous first NHL season (8-65-7), Schmidt went 3-28-5 before getting canned. Yes, that’s three wins in 36 games. Not great. December 29, 1984 – In a 6-3 Oilers win over the Red Wings, Wayne Gretzky picked up a hat trick (his 32nd) and added three assists (six points, meaning he accounted for every Oilers goal) to record his 100th point of the year…and it was his 35th game. It was the second fastest in history. It’s too bad he was beat out by that Gretzky guy (he reached the mark in 34 games in the previous season). December 29, 1988 – Toronto’s Ed Olczyk and Gary Leeman scored goals just four seconds apart in the third period, tying the record for fastest two goals by one team. The Leafs beat the Nordiques 6-5. December 29, 1992 – The Kings scored the first two goals of the game, then allowed the next 10. The Flyers scored 10 unanswered goals, including Rod Brind’Amour’s first NHL hat trick (he also had three assists). Pretty embarrassing.